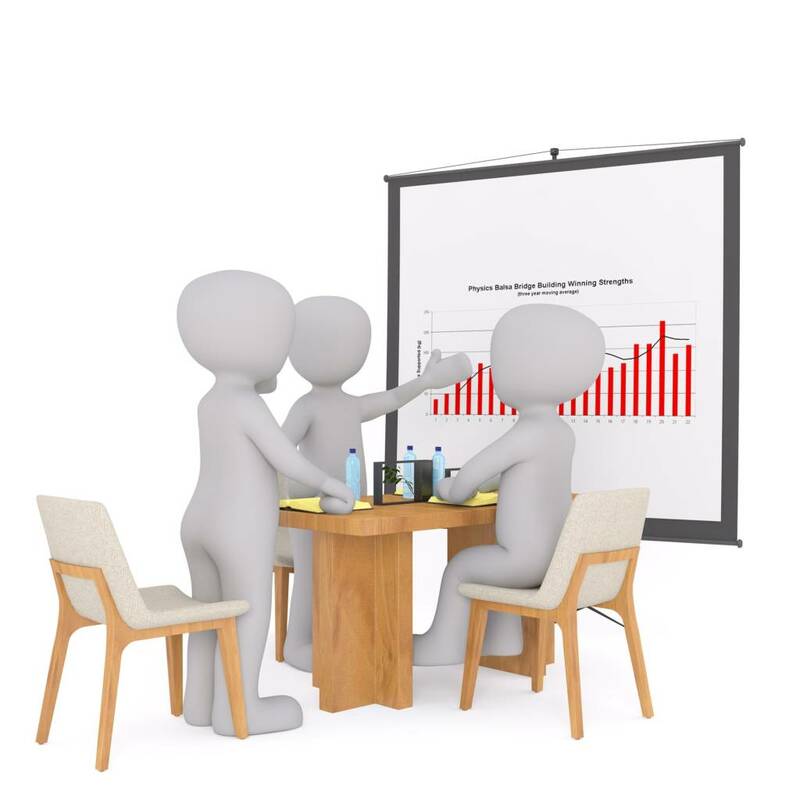 Most of us have heard of the saying “if you can’t measure it, you can’t improve it”, as a result, most businesses require that metrics and indicators be established and regularly reported on. 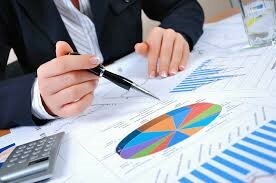 Reporting metrics have become an essential part of any management process and forms the basis for most continuous improvement process. This is no different for environmental and safety systems. 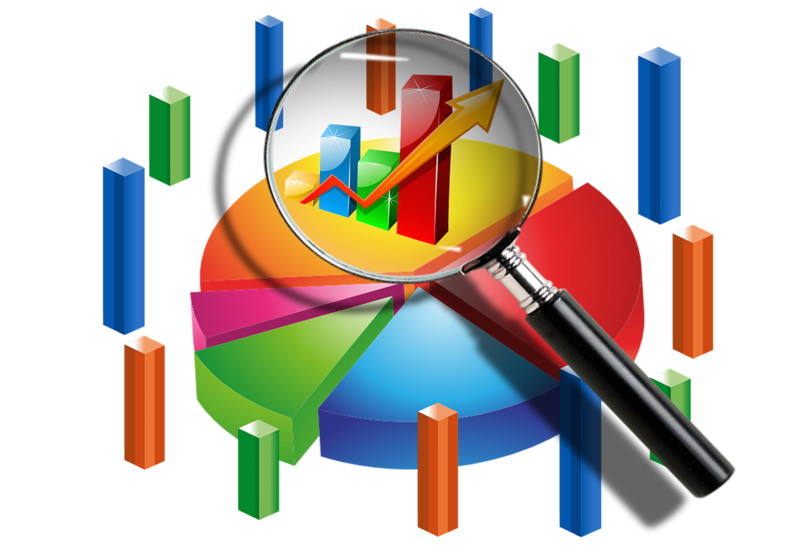 Monitoring environmental and safety performance provides a useful way for a business to see how they are performing. Typically, safety and environmental indicators are comprised of lagging and leading indicators. The remainder of this Insight will provide an overview of these indicators and their potential application. What is a lagging indicator? Lagging indicators are typically “output” or “an after the event” measures (Intrafocus, 2019). Lagging indicators measure a company’s environmental and safety incidents in the form of past incident or accident statistics (Middlesworth M, 2018). Some examples of environmental lagging indicators include the number of environmental incidents or breaches, environmental costs incurred, amount of waste generated, the number of fines and violations etc. Examples of safety lagging indicators include injury frequency and severity, safety recordable injuries, lost workdays and worker’s compensation costs. Traditionally, lagging indicators are the bottom line numbers used to indicate progress toward compliance with environmental and safety rules. Essentially, lagging indicators tell you how many people got hurt and how badly or how many environmental breaches occurred. Generally, lagging indicators are easy to quantify and understand (GEMI, 2019). However, they do not identify the root causes of the incidents and accidents, or tell you how well your organisation is doing at preventing incidents and breach. Also, lagging indicators may not occur with enough frequency to be reliable indicators of performance (De Cieri, H. et al, 2015). A leading indicator is a measure preceding or indicating a future event used to drive an outcome, or more simply they measure “ïnputs”. They include the implementation of activities, practices and measures carried out with an expectation to lead to improved environmental and safety performance (GEMI, 2019). Examples of leading indicators include environmental and safety compliance audits, environmental and safety training and employee perception surveys. The great thing about leading indicators is that they are proactive in nature; they report what employees or business are doing to prevent incidents or improve the environment. They can provide early warnings by enabling risks or potential failures to be detected and mitigated before something bad happens (De Cieri, H. et al, 2015). For example, instead of just monitoring reportable incidents, a leading indicator would monitor the number of audits or training initiative/session conducted over a period. Where the audit programs are implemented, and failure or improvement opportunities identified and action, typically we see a decrease in lagging indicators. On the downside, leading indicators can be difficult to quantify, and the results may not address the concerns of some interested parties (such as the public), who may still want to know the quantities of chemicals released into the environment or the number of health and safety violations. The main differences between leading and lagging indicators are shown in the table below. So, the take away is: a leading indicator measures performance while a lagging indicator measures failure. Leading indicators can influence change while lagging indicators are not useful when a business is trying to influence what happens in future. 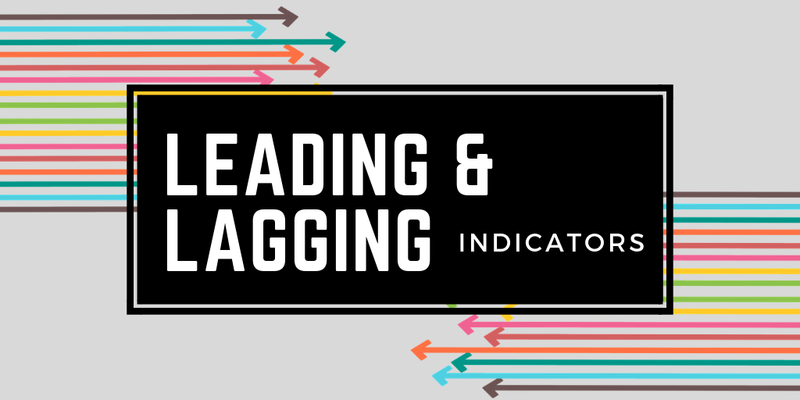 Are you tracking the right leading and lagging indicators? To measure performance successfully, it is a matter of using an appropriate mix of both lagging and leading indicators to provide a full picture, rather than using one over the other. As demonstrated above, both leading and lagging indicators have their advantages and disadvantaged, which is why it is best practice to use both. Where lagging indicators are used without leading indicators, it is impossible to know the cause of any improvement/decline in performance. Where leading indicators are used without lagging indicators a lot of good work can be done, but without being able to show the results. As such, one type of indicator without the other is only half of the story. prompt an appropriate response, leading to a consistent focus on implementing change (ICMM, 2012). If you are considering using leading and lagging indicators to track your environmental and safety performance or even making changes to the indicators you are using currently, consider the information above as a first step. Once you have established the appropriate mix of indicators for your organisation, ensure that there is follow up on the intelligence obtained from the leading indicators by implementing process change required to prevent incidents and accidents proactively. Integrate Sustainability has a well of experience in assist business to develop or review the environment and safety performance monitoring systems. If you need some advice or assistance with developing or reviewing your leading and lagging indicators contact us on 08 9468 0338 or enquiries@integratesustainability.com.au. Australian Constructors Association. (N.D). 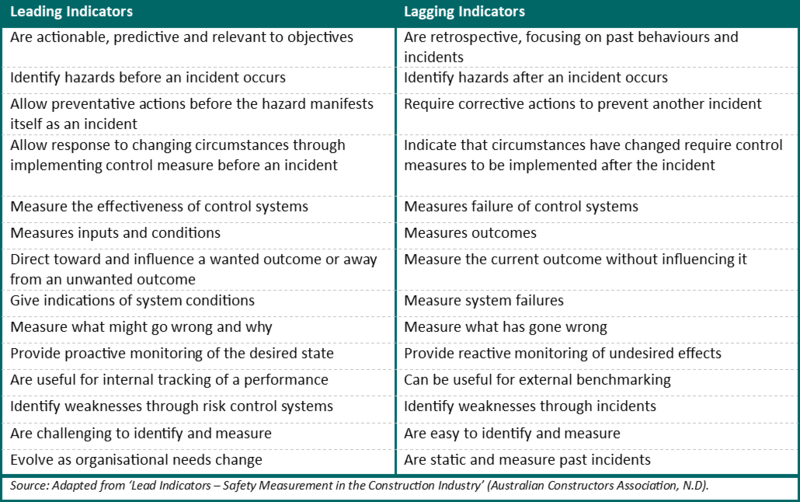 Lead Indicators – Safety Measurement in the Construction Industry. De Cieri, H. et al. (2015). Leading indicators of occupational health and safety: A report on a survey of Australia Nursing and Midwifery Federation (Victorian Branch) members, prepared for the. Melbourne: Monash University. ICMM. (2012). Overview of leading indicators for occupational health and safety in Mining. International Council on Mining & Metals.